After a disastrous trip from Denver, Ross and I made it back to Italy the Saturday before Christmas, rather than the Friday as originally scheduled. Which meant I was still exhausted and jet-lagged when I made a dash into Milan to see friends that Monday. After having tea downtown with Mary Ellen, I had some time to kill before meeting Enrico, so I wandered over to the Duomo and Galleria area to enjoy the Christmas decorations. 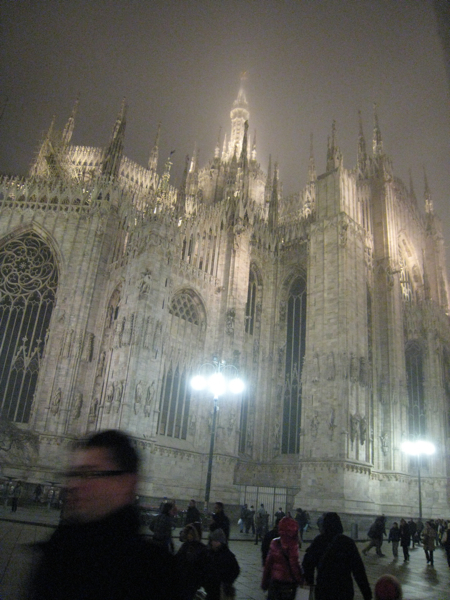 It was a foggy night (typical of Milan in winter), which lent a magical softness to the scene. This year’s theme at La Rinascente, the fancy department store next door to the Duomo, was apparently crystal, resulting in some unusually attractive escalators: The outside windows contained tableaux of “Swarovski-inspired” fashions which mostly looked weird, but I did like the beds of crystals the mannequins were standing in. Beneath the central dome in the Galleria is a mosaic floor including this representation of a bull which I believe is a symbol of the city of Torino (torino literally means “little bull”). There’s a custom in Milan to place your heel firmly on the bull’s testicles and spin, as this man was illustrating to his wife: …resulting in the damage you can see below (the mosaic is repaired from time to time). This is supposed to bring good luck, though it seems to me it might have originated as a dispetto (sign of disrespect) for the rival city. La Scala. I’m still not used to it being painted white. The vertical and horizontal strips of lights behind outline the new wing that was added in the recent restoration. This entry was posted in Italy travel and tagged Italian Christmas, Italy travel, living in Italy, Milan on December 30, 2008 by Deirdre Straughan.